Through the study of theorists and practitioners of the arts, students discover the aesthetics of art forms and are able to analyse and communicate in specialized language. Using explicit and tacit knowledge alongside an understanding of the role of the arts in a global context, students inform their work and artistic perspectives. The acqusition and development of skills provide the opportunity for active participation in the art form and in the process of creating art. Skill application allows students to develop their artistic ideas to a point of realization. The point of realization could take many forms. However, it is recognized as the moment when student makes a final commitment to her artwork by presenting it to audience. Skills are evident both process AND product. The arts motivate students to develop curiosity and purposefully explore and challenge boundaries. Thinking creatively encourages students to explore the unfamiliar and experiment in innovative ways to develop their artistic intentions, their processes and their work. Thinking creatively enables students to discover their personal signature and realize their artistic identity. Students should have the opportunity to respond to their world, to their own art and to the art of others. A response can come in many forms; creating art as a response encourages students to make connections and transfer their learning to new settings. Through reflecting on their artistic intention and the impact of their work for audience and themselves, students become more aware of their own artistic development and the role that arts play in their lives. Students learn that the arts may initiate change as well as being a response to change. iii. critique the artwork of self and others. What might students KNOW and UNDERSTAND in music? What skills might students DEVELOP in music? 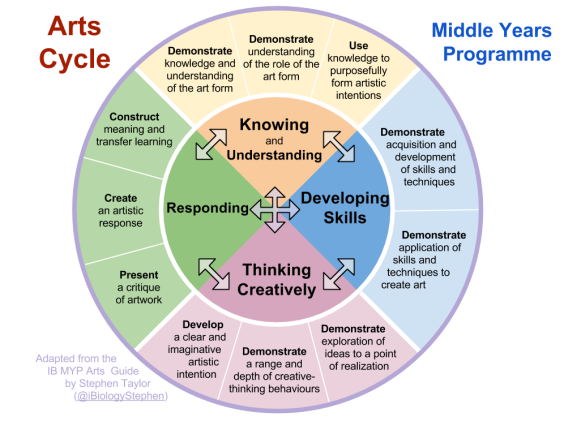 How might students think CREATIVELY in music? How might students RESPOND to or through music? Music is a very essential part of curriculum for MYP secondary students Year 1 until Year 6 (Grade 7 until 12) in Sekolah Victory Plus, Bekasi. Furthermore, to make it more challenging and deepening, it is an elective course for students Grade 10 to 12, which they will choose a very specific instrument in 3 big main division : orchestra, band and choir. Therefore students from grade 10 to 12 are expected to be fluent in playing instrument and singing as well. To have a continuous musical appreciation as a lifelong culture, people can only start it by understanding music from the very core : Performing. Music performance is the entry gate of music education for our kids. It is also the future of our music cultural development as a nation. This is the main objective of music curriculum in Sekolah Victory Plus. To formulate a very serious curriculum in producing a very serious music is nevertheless impossible for general school like this since we are not a music school nor the one that affiliated to any music institution. Music curriculum has also the biggest challenge to adapt the National Curriculum in a very dynamic country like Indonesia. However, big optimism grows up every year since many schools can make a quiet good performing arts and exhibition for so many years. A few are very brilliant to make annual concerts since they have an established school symphony orchestra. Sekolah Victory Plus is one of them. To make all of these things happen we make a very sorted general outlines for our music education in Sekolah Victory Plus. Since we are an IB School we want to highlights 3 Main Outcomes in our music curriculum. Those 3 are Listening, Composing and Performing. Thus, grade 7 until 12 is very familiar with these three main outcomes in the learning experience. We hope that this blog can helps you to understand what your children should achieved based on their level.